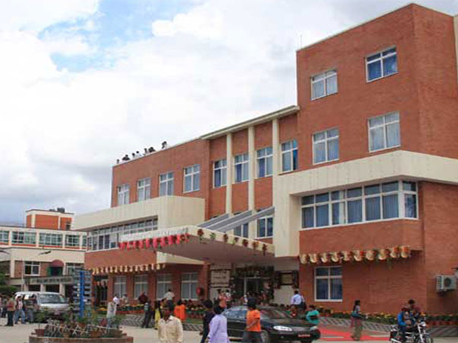 KATHMANDU, May 16: Private medical colleges under Tribhuvan University have breached the rules by charging additional fees which exceed the ceiling set by the government. The government has fixed a ceiling of Rs 2.2 million for the post graduate course in medical sciences. However, private medical colleges affiliated to the Institute of Medicine (IOM) have been found charging additional Rs 0.9 million to Rs 1.6 million, according to the students preparing to enroll in Master's Degree in Medical Sciences. "I was asked additional Rs 500,000 per year by Universal College of Medical Sciences (UCMS), Bhairahawa," said Dr Kumar Paudel, a prospective PG candidate of UCMS. "Recently, we visited every medical college under IOM for admission," he said, adding, "Many of them sought additional fees while a few of them have challenged the government in court arguing that they can't teach the PG students by accepting the fees fixed by the government." Prof Dr JP Agrawal, dean of the IOM, said that the medical colleges can charge additional fees only for hostel charge and food as well as exam fees which it should pay to the government. Dean Agrawal further said that the IOM is not the authority to take action against the private medical colleges. "Only Tribhuvan University has the authority to take action against them," he added.